A downwind landing is seldom a good idea. An inexperienced seaplane pilot attempting one with huge logs floating across the landing path is a really bad one. My first flying lesson was in a Piper J-3 floatplane on the Hudson River in 1967. That exciting day led to a private pilot license and 300 hours of land plane time. I often returned to that Peekskill seaplane base on the Hudson to admire a Lake Amphibian based there. One day the owner invited me for a ride. We taxied down the wooden ramp into the Hudson and, without ground or tower radio contact, we were airborne in minutes. That was the day I decided I wanted a Lake of my own. So when I moved to British Columbia in 1974, I was delighted to find an ad in the Vancouver Sun offering a 20 percent share in a new Lake for $5,000. I called Ed, the Western Canada Lake dealer, and was a bit disappointed when he explained that this Lake was the only Lake ever made without wheels—a flying boat, not an amphibian. He had it moored to a log floating in the Fraser River. They arrived one Friday in September, and we loaded the Lake with fishing gear, sleeping bags and a small inflatable dinghy. A sparse panel and no wheels or lights gave the Lake an empty weight of only 1,360 pounds with a useful load of 1,040 pounds, making a sea level takeoff from the Fraser River an easy task for the 180-hp Lycoming. We flew northwest along the rugged BC coast towards a fuel stop at Ocean Falls using the plane’s only navigation instrument (the compass), charts and my watch. 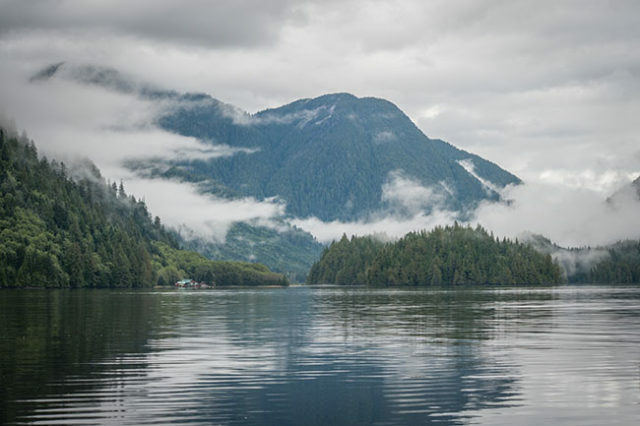 It was my first trip as a “Canadian bush pilot.” I thought a cautious way to land in the sea at Ocean Falls was to fly up the inlet, just south of Ocean Falls, and then turn north through a small, low gap in the mountains to Link Lake, located just above the town of Ocean Falls. That would put us in a position to land going out to sea and into the wind. So that is what I did, making a smooth landing in the relatively calm sea. We taxied to the fuel dock, and while I filled the gas tank, Bill went to fill our bottles with fresh water that was pouring from a pipe driven into the mountain. Ocean Falls gets 300 inches of rain every year, and it just pours out of these pipes all day and night. We taxied to the end of the inlet, avoiding the log booms floating just off shore, and took off for the Dean River fishing camp. We flew over the camp’s dock and circled to land in front of a beautiful, 500-foot waterfall at the end of the inlet. Felix, our guide, met us at his dock and insisted that we quickly unload and tie the tail of the plane to his dock and the bow to a shoreline tree with plenty of slack because the tide was running out, and the plane and his dock would soon be sitting on the muddy bottom. We fished until dusk and all day Saturday, catching Coho salmon and large steelhead. Sunday morning a 300-foot ceiling was dishing out a steady coastal rain, and I was trying to decide whether to wait and see if it improved or just fly down the inlet a short distance to the same “Link Lake backdoor approach” we had used on Friday to land into the wind at Ocean Falls. Bob’s response was, “What you’re saying is, it would be much too dangerous to fly if it gets the slightest bit worse.” I said, “Right,” and we jumped in the plane and took off. We were flying just under the 300-foot ceiling in the rain when we got to the “Link Lake back door” pass we had used on Friday. It was in the clouds above the 300-foot ceiling, so we had to fly out to the coast and north a few miles to enter Ocean Falls directly from the sea. This set us up with a 20 mph tailwind, and the 300-foot ceiling created a scary box with granite walls on both sides and a mountain straight ahead. I was flaps down, ready to foolishly try a downwind landing, when I saw the huge log booms flashing by right under us at 75 mph (my 55 mph landing airspeed, plus a 20 mph tailwind). Thinking I was trapped in a box and would have to land straight ahead, I pulled the power off as soon as the log booms were behind us and started hitting the water too fast to settle on. Bob told me we hit seven times. We were approaching the end of the inlet, so I added full power and pulled up to about 100 feet, adding lots of right rudder to make a tight turn within the granite walls. Once we were facing into the wind, our speed over the water dropped from 75 mph downwind (55 plus 20) to 35mph (55 minus 20) into the wind, still a rough landing in the 3-foot swells. But at least I was on the water as a boat—no longer an airplane! I dropped the water rudder and started a right turn toward the fuel dock, but the right wing started dragging in the water. I saw that the right sponson that keeps the wing out of the water had been ripped off, probably by an unseen log boom. Continuing in this direction would allow the wind to get under the left wing, forcing the right wing under water and quickly causing us to capsize. I immediately reversed course away from the fuel dock and toward the opposite rocky, forested shore. This kept the right wing into the wind and out of the water while the left wing sponson kept the left wing just above the waves. We hit the shore just where a log had washed up, which provided a landing buffer. Bob jumped onto the slippery log and secured the plane while Bill and I struggled to pump air into the dinghy. I jumped into the ice-cold water up to my armpits and tied the inflated dinghy under the right wing to replace the lost sponson. That’s just about the time two Good Samaritan rescue boats arrived. Bob and Bill jumped into the first boat, and I stayed in the plane and switched on the electric bilge pump as the second boat attached a towline. He towed me back to a wooden seaplane ramp with the pump spraying water out of the leaking hull (we popped a few hull rivets), and the dinghy kept the damaged right wing out of the water. My call to Ed went as expected. When he finished yelling at me for landing in the sea and adding up the money I was going to owe him, he agreed to send the Lake’s beaching gear up on the morning Grumman Mallard flight from Vancouver. Once the big Mallard was off the seaplane ramp, I taxied the Lake to the ramp, where we donned our waders and affixed the beaching gear to the sides of the fuselage and under the tail. After we hauled the Lake out and tied it down, I pulled the hull drain plugs and hosed out the salt water. We took the morning Mallard flight back to Vancouver. Ed ordered a new sponson and took it up to Ocean Falls two weeks later, attached it to the wing and flew the Lake and beaching gear back to Vancouver. The total cost of repairs and Mallard tickets was just over $3,000. A small price to pay compared to the catastrophic outcome I avoided thanks to Ed’s intense training. He used rolled up newspapers to smack me when I got the Lake into dangerous angle of attack territory or failed to set up the correct attitudes and speeds for rough or glassy water landings while he shouted, “Stop trying to kill us!” Perhaps we should have spent more time on the perils of a downwind landing. I eventually bought all of Ed’s flying boat shares and, never forgetting his admonishments, I logged 400 hours flying in British Columbia over the next 15 years without popping another rivet. category. Hope others take for real and avoid this type of trying to fly?